Learn biostatistics the easy way. This outstanding resource presents the key concepts you need to understand biostatistics and how to apply them in clinical medicine. Easy-to-understand examples and analogies explain complex concepts, and practical applications provide you with real tools for use in daily practice. The book’s organization is intuitive, so that concepts build upon one another, maximizing understanding. This book will give you the confidence to appraise the existing literature - and the vocabulary you need to discuss it. Uses an easy-to-understand presentation and writing style to make the material easily accessible. Places its emphasis on concepts, not formulas, for more clinical-based guidance. 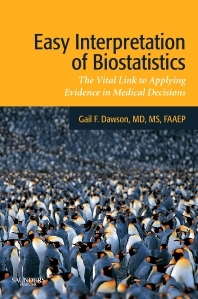 Focuses on practical applications of biostatistics to medical practice to give you a better understanding of how and why research is conducted. Presents concise but comprehensive coverage to create easily accessible yet complete information. Provides examples, analogies, and memorization tips to make the material easier to absorb.